Vad Lee is the starting quarterback this season. Lee was a big contributor on last year’s team and had a big part in helping the Jackets score 68 points against UNC. Lee is the best passer Tech has had since Coach Johnson came to Tech so the hype has been building since Vad has arrived. Redshirt freshman Justin Thomas is the backup this season and is a talented and very speedy player. Thomas is the second fastest player on the team and was the Alabama 100 meter state champion. Expect to see Thomas in almost every game since he will almost always be the fastest player on the field. Tech will run more out of the pistol formation than ever before which will make their more traditional flexbone offense even harder to stop. Tim Byerly is the third string quarterback for the Jackets. Senior David Sims returns for his third straight year as the starter. Sims had 612 rushing yards last season and is 632 yards away from 2000 career rushing yards. When Sims is healthy, he is a force to be reckoned with. Look for Sims to improve in every aspect of his game this season as he looks to become on the radar of NFL teams. Junior Zack Laskey, the leading rusher in 2012 with 697 yards, returns as well. Expect him to get lots of playing time once again and he provides a terrific one-two punch at the B-back position. Broderick Snoddy is the third string B-back and the undisputed fastest player on the team. Snoddy is a threat to score any time he touches the ball. Former walk-on Robert Godhigh and junior Deon Hill are the starters this season at the A-back positions. Both of them must continue to elevate their game this year to replace former Tech great Orwin Smith. BJ Bostic and Synjin Days will be the first backs off the bench and should both have breakout years. Tony Zenon and Dennis Andrews will see playing time as well. The 5-7 Godhigh is the x-factor at this position and led the team in receiving touchdowns last season. Godhigh will star in his last season as a Jacket. The 6-6 sophomore, Darren Waller, is the leading returning receiver for the Jackets. After the suspension of Jeff Greene and the injury of Anthony Autry the wide receiver position is the biggest question mark on offense. Redshirt freshman Michael Summers is the other starter at the receiver position and will provide terrific speed. Corey Dennis and Deandre Smelter are the backups to start the season. Smelter is joining the football team after playing baseball for three years and was a former high school standout at wide receiver. Smelter has the size and the athleticism to compete from day one. Smelter has two years of eligibility left to compete for Tech. The offensive line returns a lot of depth and experience with 103 combined starts. Ray Beno is expected to man the left tackle and Bryan Chamberlain will play opposite of him at right tackle. Chamberlain is replacing injured Morgan Bailey. Will Jackson moves back to left guard this season to join Shaq Mason. The quarterbacks and b-backs will run through the holes Shaq Mason creates. After recovering from offseason injuries, Jay Finch will start the season at center and is the key to the offensive line. Chase Roberts, Trey Braun and Auburn transfer Thomas O’Reilly are the top backups for the season. This should be the best offensive line Paul Johnson has had. This season marks the hundredth year of Yellow Jacket football and much is expected out of this year’s team. 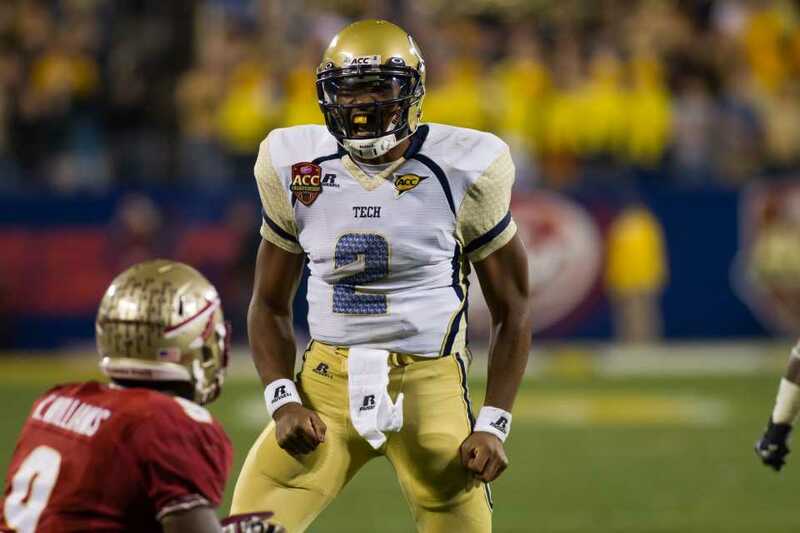 Tech will most likely repeat as the top rushing offense in the ACC for the sixth year in a row. Tech will be showing completely new formations this season as the Jackets look to spread the field even more. Vad Lee has stepped into the role as team leader and roses are on his mind. With the return of Ted Roof, the Jackets will move to the 4-3 formation. This move means that returning sack leader Jeremiah Attaochu will switch to DE. Attaochu is on pace to break the Tech sack record and has a chance to make the All-America team this year. Starting opposite of Attaochu will be senior Emanuel Dieke. Chris Crenshaw and Anthony Williams will also be a big contributors. This should be a position of strength for the Yellow Jackets. Senior Euclid Cummings will start at the tackle and the sophomore from Australia, Adam Gotsism, will start at the nose tackle position. This will be the first time since 2009 that Tech has started two defensive tackles. Cummings and Gostis don’t have great size, but are expected to use their speed to beat people off the line. Expect to see redshirt freshmen Patrick Gamble and Jimmie Kitchen contribute too. This position is the biggest question mark on the defense, but if the defensive tackles can stop the run, Georgia Tech should have one of the best defensives in the ACC. The linebacker unit should be the strongest part of the defense and returns all three starters from last season. This is the best linebacking unit in the ACC and one of the best in the country. Starting at outside linebacker will be senior Brandon Watts and junior Quayshawn Nealy. Jabari Hunt-Days will be starting at middle linebacker. Hunt-Days should star on defense and could challenge for first team all ACC. Hunt-Days is one of the best sophomore linebackers in the country and will be the cornerstone of the Tech defense for years to come. All three starting linebackers should challenge for postseason accolades. Daniel Drummond, Tremayne McNair and Anthony Harrell provide solid depth off the bench. The departure of Rod Sweeting shouldn’t hurt the Yellow Jackets that much with seniors Jemea Thomas and Louis Young starting at the corner. Jemea Thomas is one of the best defensive backs in the ACC and is one of the nation’s best playmakers. Jemea Thomas will rise up NFL draft boards with a terrific season. Louis Young is also a very proven player and provides great size for the cornerback position. Sophomores Domonique Noble and Lynn Griffin are the backups and will see a lot of playing time this year as they look to gain experience for years to come. Last year’s leading tackler Isaiah Johnson will be out for the beginning of the season due to offseason knee surgery. Starting at free safety is Jamal Golden. The other starting position will be determined by game time and will either be sophomores Chris Milton or Demond Smith. Milton, who has made a name for himself as a hard hitting player, started the Sun Bowl last season. Jamal Golden started five games last year too so there is plenty of experience in the secondary. The Al Groh era is over and the Ted Roof era has begun. Roof is a recognizable name for Tech fans as he was a star on Tech’s heralded “black watch defense” of the 1980s. Since last coaching at Tech in the early 2000s Roof has returned with a national championship ring that he won as the defensive coordinator for Auburn. Roof has inherited some very talented players and Tech has an excellent shot at winning the ACC with an improved effort from the defense.